We see many strong climbers come in and out of the doors of Aiguille, performing the most powerful moves on the Wave or performing laps on 5.12 with ease. Yet sometimes it is the climbers that are not in the spotlight that have the most impact in our community, or in this case, also a coach. Eugene Hoberg, coach of our Team Aiguille youth climbing team, is always climbing, training, coaching, and teaching not only his kids but all members at the gym. A figurehead for over 10 years in our climbing community, Eugene’s story within our Aiguille family is surrounded by not only hard work and long hours, but also passion, love and trust. Eugene was born in the Philippines but ended up moving to Orlando when he was in the 9th grade. In charge of planning and supervising some of the largest conventions and tradeshows in the nation for over 40 years, his hard working attitude and enthusiastic personality make him a perfect addition to the Aiguille family. 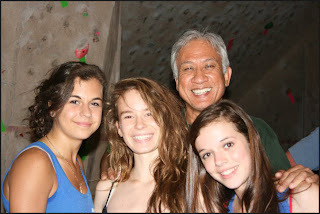 However, climbing wasn’t even a part of Eugene’s life until he came to Aiguille Rock Climbing Center. “I started climbing with my son, Ben, almost 13 year ago...We were basically looking for another sport activity to do which led us to the gym.” From then on began a new passion that would lead Eugene to travel all around the world. It came to be discovered that Ben would have a real natural talent. 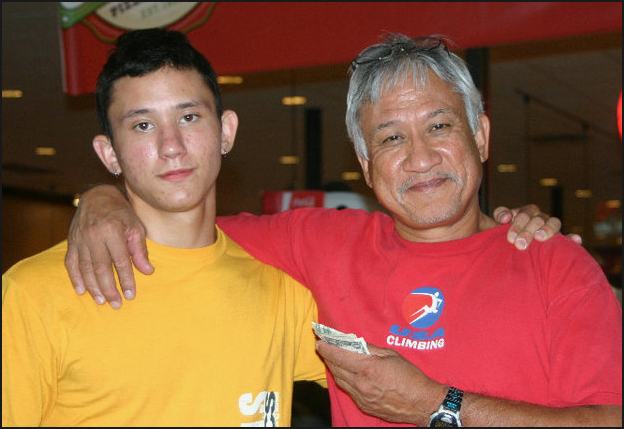 “I slowed down my own personal climbing and started researching and working with him on becoming one of the best climbers in the country in youth competitions.” By the time Ben finished his youth climbing career in 2010, he had won three national championships, been a US Team member eight times, competed in three Continental Championships and five Youth Worlds, placing 6th in the world in Scotland his last year. With Ben’s success, Eugene was able to find a new passion in climbing: coaching. Through national and world class competitions, Eugene met some of the world's most renowned coaches and asked many questions. “They were always willing to share that they know.” For him, the coach and climber relationship came almost natural with Ben and he valued and focused on the communication that came along with it. These developed skills are what have made him a perfect candidate for coaching Team Aiguille and to continue doing it to this day. 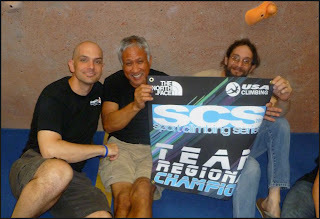 Through Eugene’s coaching, Team Aiguille has sent multiple climbers to the national championships in the American Bouldering Series and the Sport Climbing Series, won multiple regional championships in both series, and has trained some of the strongest kids in the state of Florida. But in the end, titles are just titles. In Eugene’s eyes, developing trust between his climbers and him is the most important aspect of coaching. “Coaching is seeking out what is in the student’s heart and finding a way to bring it out. Driven by the desires in their hearts, they are going to a place that they have never been before. Therefore, they will have to do something that they have never done before...This means a trust must develop between the coach and the students. 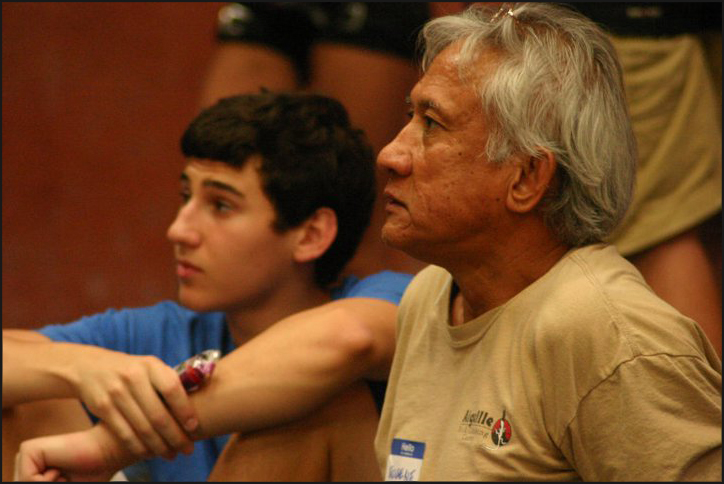 The student has to trust that the coach knows how to get them to this place and the coach has to trust that the student is willing to do what it takes to get there.” As a father and a grandfather, Eugene’s approach can almost feel fatherly as that trust begins to develop. 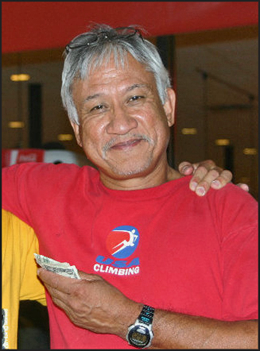 Many climbers, whether they be one of his students or random members in the gym, will ask Eugene for training tips and he is more than welcome to share his mind. Currently, Eugene is training Ronnie Dickson, Aiguille member and amputee climber as he prepares for Paraclimbing World Championships in France this month. While watching them train, I could only sit in amazement as Eugene and him would stand staring into the heights of the lead room, talking out every movement on each route Ronnie prepared to climb and then would turn him around and ask him to recite each move back. By knowing the formats of these competitions, Eugene has picked apart Ronnie’s needs as a climber, understanding that onsight climbing was going to be his greatest weakness, and worked with him on it for the past few months. “Training should be driven by the magnitude of the goal. Once a climber decides on a particular goal, the appropriate quantity and quality training must go with it. You can’t be a national caliber climber by training six hours a week. There’s a pretty good amount of prioritizing and sacrifice that comes with certain levels of goals. Especially in competition climbing, you get one attempt at a route that will determine whether you are advancing or going home.” With the Team Aiguille season starting again this September, the sacrifices will be begin. In this writer’s opinion, Eugene has done enough sacrificing and should have more time for himself! It has been very exciting seeing him in the gym almost 4 times a week climbing lead and working out in the training area. 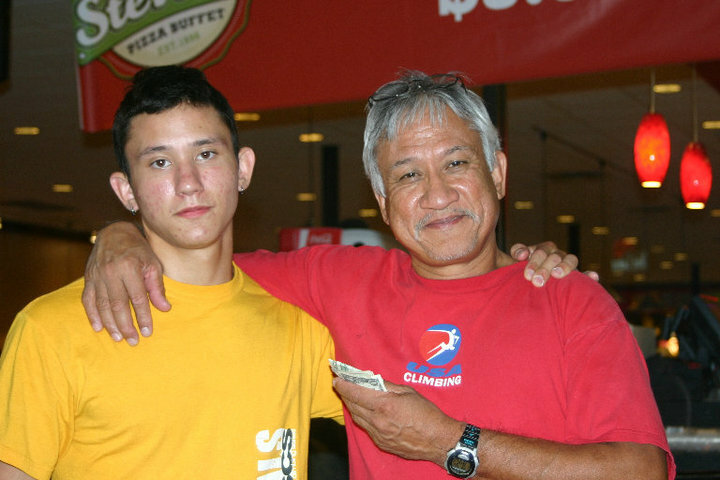 With his son moving out to Colorado to follow his own climbing dreams, Eugene has been able to focus more on his own goals. 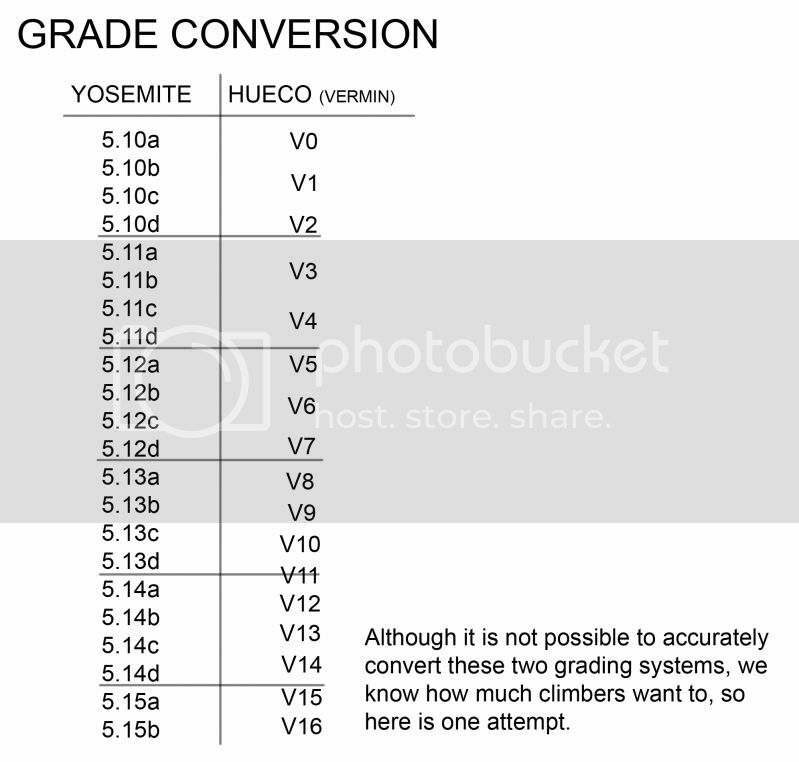 “My future goal is to be able to climb 5.12s outdoors. This will be an on and off type of training due to coaching and the other ‘cares of this life’. But be sure, I will always be heading in that direction.” When talking about his climbing style, he gave me a pretty good laugh describing it as involving “attempting to utilize everything that I have without using too much energy. I believe in achieving the utmost with the minimum.” But don’t expect him to campus, “because I can’t. 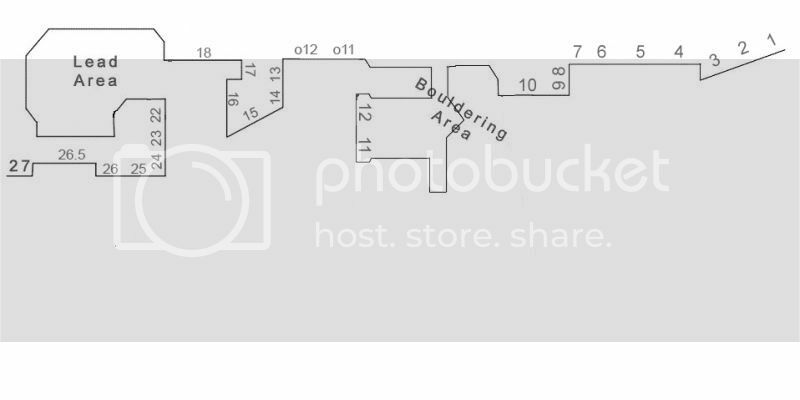 Ha ha!” Outside of climbing and working, when he has the time, Eugene has also been pretty good at tennis, softball, slalom water skiing and ping pong, and is excited to visit Ben and try out some winter sports. Despite his maturity (since I’m not using the word age! ), Eugene can probably outdo some of us, including myself, in almost every athletic activity. Anyone “can see through my health and conditioning that rock climbing can be an activity at any age.” He has climbed all over the nation the past twelve years at almost a hundred different gyms as well as Foster Falls, Smith Rock, Sandrock, Looking Glass, Rocktown, Rumney, the New River Gorge and the Red River Gorge. He dreams to go to Rodellar after talking to climbers Brian Antheunisse and Cicada Jenerik, but wants to go in the fall so he can attend the Sport Climbing World Cup events. So if you’re ever in the gym and have a question about comps or training, you can bet that Eugene is a good candidate to having an answer and, along with it, a great laugh. I know I always do! As a great coach, great father, and great friend, I was very happy to introduce Eugene to all of my readers. If you are interested in being a member of Team Aiguille, feel free to ask a staff member or email TeamAiguille@gmail.com.